The aim of this project is the development of integrated smart wearable sensors for emergency disaster intervention personnel. The CLARITY (The Centre for Sensor Web Technologies at Dublin City University) team is involved in the integration of gas sensors into wearables for detection of hazardous gases like CO and CO2. This research arose through involvement in a joint European Union-funded FP6 project called Proetex (www.proetex.org). The aim of the project is to develop textile- and fibre-based integrated wearable sensor systems. Such systems will improve the safety and efficiency of emergency personnel by monitoring the health status of the operator and the surrounding environment for potential risk sources. Some of the issues covered are monitoring of vital signs, posture and activity, external hazard monitoring, and low-power wireless communications. The project is closely connected with other large European projects on smart textiles, wearable sensing and associated applications  it brings together and extends the technology developed by previous projects (see for example www.biotex-eu.com). The project brings together 23 partners from a range of backgrounds  universities, research institutions, industrial partners and end users  drawn from laboratories in France, United Kingdom, Poland, Italy, Belgium, Switzerland, Germany and Ireland. Researchers from CLARITY based in the National Centre for Sensor Research at Dublin City University are involved in the integration of sensing platforms into wearables for the detection of environmentally harmful gases surrounding emergency personnel. Special attention is being paid to carbon monoxide (CO) and carbon dioxide (CO2). These gases are associated with fires and mining operations, and it is of the highest importance to warn and protect operators from potential harm caused by over-exposure to high concentrations of these gases. The objective is rapid detection of the status of an environment (low, medium or high hazard) and real-time communication of this information to the garment wearer. Critical in this identification of potential toxification is a reliable method of measuring CO/CO2 exposure. Commercially available sensors have been carefully selected and are being integrated into the outer garments of firefighters. The sensors provide sufficient sensitivity to reliably alert users to the presence of these harmful gases. Another important aim is to achieve wireless transmission of sensor signals to a wearable wireless base station that gathers, processes and further transmits the data. When selecting the appropriate commercially available sensors for the gas sensing application, special attention was paid to sensor size, robustness, sensitivity and power requirement. Electrochemical sensors satisfy most of these requirements, especially in terms of size and power requirements. CO is detected using an amperometric sensor in which the current between the electrodes is proportional to the concentration of the gas. On the other hand, the CO2 sensor is potentiometric. In this case, the reference and working electrodes are placed in an electrolyte that provides a reference CO2 concentration. The measured potential is based on the difference in concentration between the reference electrode and the outside air. Both types of sensors are very sensitive and give an accurate reading (in parts per million). This means that both low concentrations of these gases (which can be hazardous over long periods of exposure) and high concentrations (which pose an immediate danger) can be accurately detected. The signal obtained from these sensors is transmitted wirelessly to the wearable base station using Zigbee. Power is supplied to the sensors using a nickel metal hydride rechargeable battery. The CO2 sensor is placed in a specially designed pocket located on the firefighter's boot. The pocket is designed not to obstruct the firefighter's activities. The prototype currently used for testing is shown in Figure 1; note the side pocket containing the CO2 sensor along with the wireless sensing module and a battery. The pocket has a waterproof membrane that protects the sensor from moisture, but allows gas to pass through. The CO sensor will be integrated in the firefighter's outer garment (ie jacket). All sensed information will be fed to a wearable local base station that shares the data with a remote centralized base station. The ultimate goal is to achieve local communication between firefighters and civil workers in the operations area, as well as longer-range communications between these personnel and the support team outside the operations area. 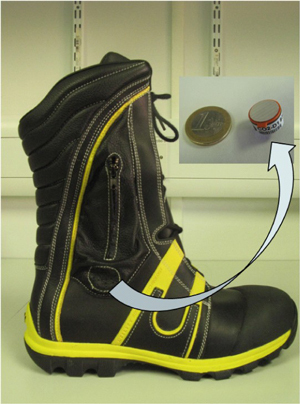 Figure 1: Firefighter's boot with built-in pocket used for enclosing the CO2 sensor and wireless communications platform. The project commenced in 2006 and will end in early 2010. The project is envisioned to produce three sets of prototypes during the four years of its existence; so far two generations of prototypes have been successfully developed. At this stage, accurate wireless transmission of the sensor signal has been successfully achieved (see Figure 2). Future activities will include evaluation of prototypes in laboratory and field conditions. Their performance will be compared to that of existing technology, and will be improved upon by customizing the products according to the specific user needs. Finally, the products will be tested in real-life situations as an ultimate proof of their full functionality. 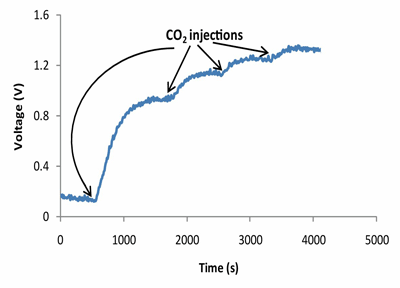 Figure 2: Wirelessly transmitted signal from CO2 sensor calibration (range atmospheric to 42000 ppm CO2). Sensor was enclosed in an airtight chamber and CO2 was injected. The authors gratefully acknowledge the financial support of the European Union (Proetex FP6-2004-IST-4) and the Science Foundation Ireland (07/CE/I1147).